Also called temporary dike, the cofferdam is a temporary system of diversion, retention or dispersion of water that may be used to a depth of 3 metres. Its purpose is to temporarily redirect a current of water in order to dry out the dam site itself so that the necessary work can be performed. It is composed of a system of tubular supports made of freestanding welded steel, covered with a membrane of flexible and waterproof fabric, suitable for all types of environments. The PORTADAM® technique allows you to perform several categories of works requiring dry conditions, without resorting to excavation, filling, pile driving or the installation of a sand-bag dike. 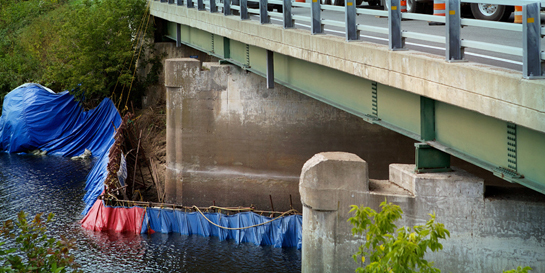 Efficient and simple to use, the cofferdam is the optimal system for any type of construction, fortification or repair requiring a non-submerged portion. As is the case for all the equipment and work methods used by Aquapera, the cofferdam is a system with low environmental impact. This dike does not penetrate the ground, no plant resource is used in its manufacture, its installation is simple and therefore requires no destruction of the local area while eliminating the risk of cross-contamination between the worksite and the bodies of water.